Birch Hill trails are wonderful thanks to trail donations and the piston bully work of Tom Helmers. 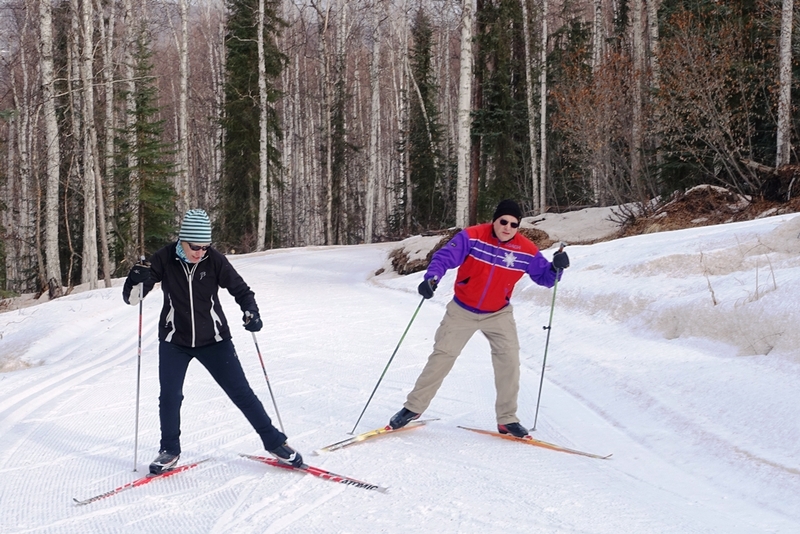 The Sonot Kkaazoot organizers were able to take a relaxing ski on Easter Sunday in preparation for the 2016 event, when our technique and fitness will be much improved. Here’s Eric Troyer, the head of Sonot Kkaazoot publicity showing the uphill technique he’s learned from Pete Leonard’s FXC Masters class. And following him are Frank Soos, head of Sonot bib pick-up and late registration followed by Eric Buetow, one of our Fort Wainwright road crossing team leaders. 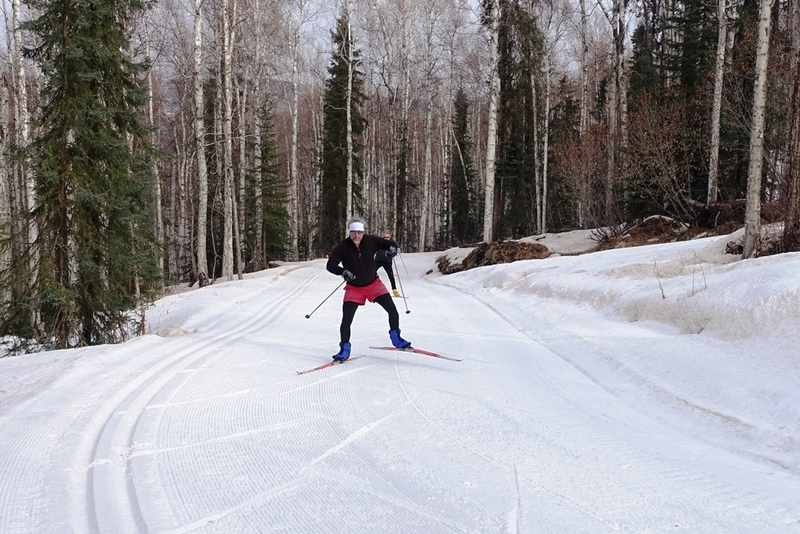 Bill Husby (aka Poles) was skating today after a season of grooming at Birch Hill and heading up Sonot Kkaazoot trail snow enhancement and brushing parties. 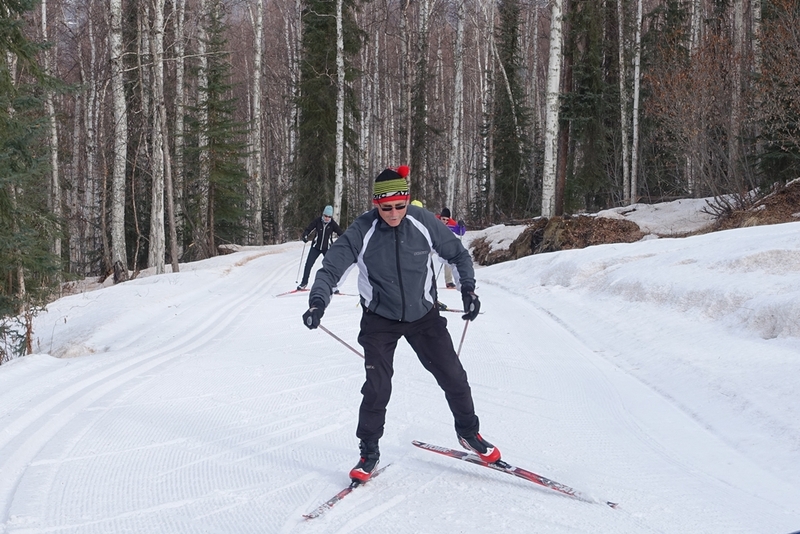 Dermot Cole was the SCUM reporter on the course and videotaped the 50 km start as well as the last wave of skiers up the Fort Wainwright alpine hill. 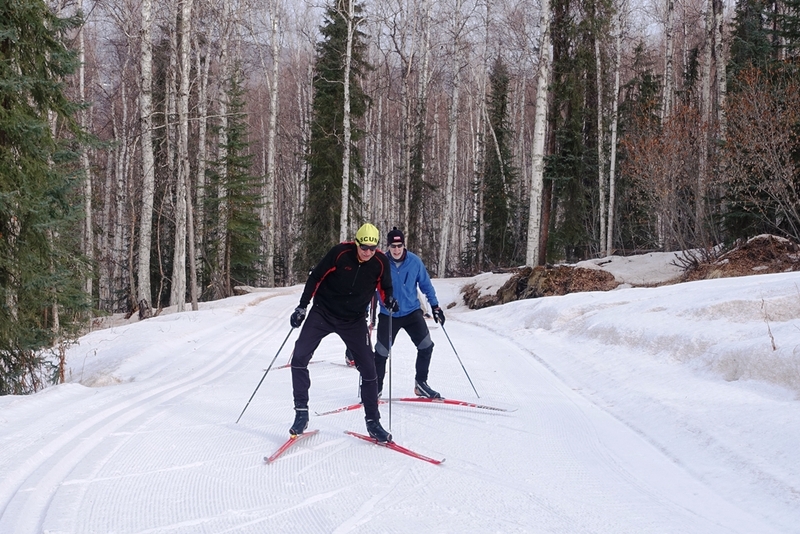 Dermot (on right in photo below) was a key snow enhancement worker on the river and on the Sonot Connector in the week leading up to the Sonot Kkaazoot: and all the skiers were enjoying the easy ski out of the black loops today: Enjoy the wonderful trails while they last. Spring really is right around the corner. 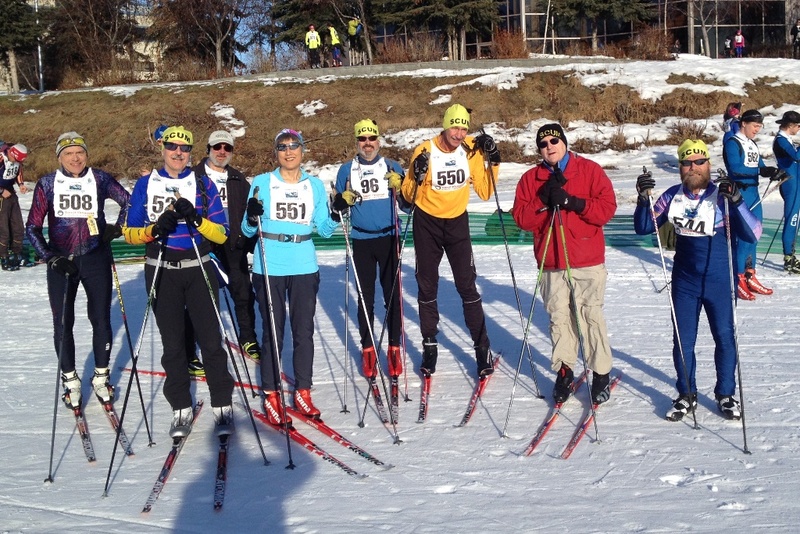 Some of the SCUM who played a major role in the Sonot Kkazoot weren’t skiing on Easter Sunday, so here is a partial group photo taken by Kent Karns on race day. From left to right: Steve Clautice (#508) helped set up and serve at the Awards Ceremony; to his right is Robert Hannon who headed up contact with the military and organized the Fort Wainwright road crossing teams; to his right with the ball cap is Mike Schmoker, who with Bernardo Hernandez constructs and distributes Sonot woodels and other awards; #551 is Mom, head Sonot janitor and crisis coach; #96 is Mike Ruckhaus, snow mover and trail enhancer; #550 is Frank Soos, guru in charge of bib distribution, late registration,and swag; Dermot Cole with all the extra clothes was a key snow enhancer on the river and Sonot Connector; and to his right is Chris Puchner, who organized all the feed stations and headed up the set-up and take-down of the finish area on the river. 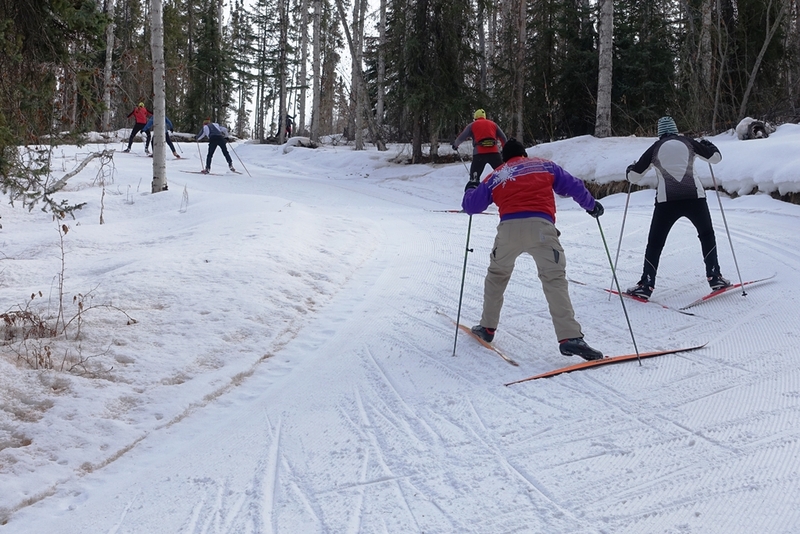 This entry was posted in Sonot Kkaazoot race organizers and tagged Birch Hill trail grooming, black loops, FXC Masters class, spring skiing by Sonot Kkaazoot. Bookmark the permalink.